If you’ve got something to work on with several excel files. More than 150 excel files generated by a web based application have to be merged into one file and then create a summary from it. A simple way to combine or merge multiple excel files, with macros in Excel. 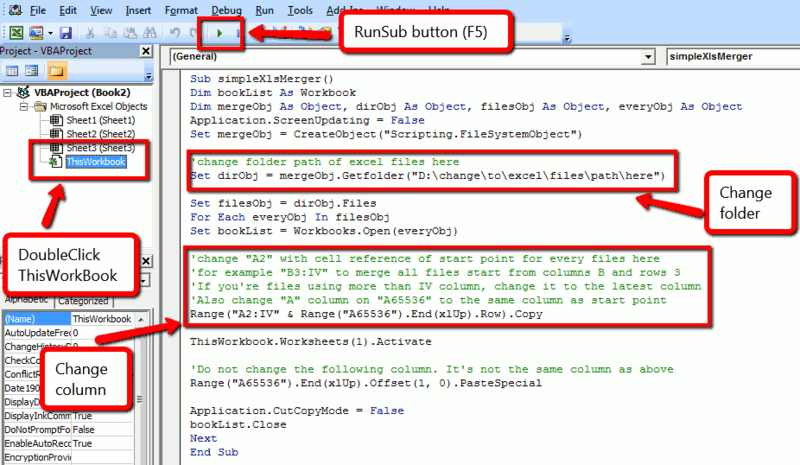 If you’re not familiar with office macros, do not worry you can use it easily by just write a simple xls file merger code on vb editor, change the working folder path and cell starter reference name inside the code to suit your reference, and then click Run Sub. All excel (xls or xlsx) files inside working folder will be merged into current worksheet. For more detail, here’s is a step-by-step intro. Gather all xls or xlsx files that you wanted to merge into a folder. Remember that this merger macros will only grab the first worksheet on spreadsheet files. So make sure that all contents is on the first worksheet before continue. Close all working excel files so you can focus only on merging files. On MS Excel, create new spreadsheet by simply pressing CTRL+N. And open Microsoft Visual Basic editor by pressing ALT+F11, you’ll see a blank text editor. Now open by doubleclicking ThisWorkBook on the left sheet menu. Change also column start reference to suit your need (usually first row used by column header, so i used A2 as start point). For example to start merging all files from column “B” row “1”. Change “IV” only if you have files using column wider than column “IV”. Basically, it will try to copy values on all available columns. If you notice the latest column on new worksheet is “IV”, it is the default available column on until your columns growth more than that. If everything configured already, press “F5″ or click on play icon to run the code (RunSub). You’ll see working progress on left sheet menu. If all done, you can now switch to worksheet to see the result. If you set a new folder within the code, and then hit “F5″ or press SubRun button, the result will be added into current worksheet bellow the previous data. That’s mean it will not overwritten the last result but as another merge to previous merged data. In conclusion, you can spam change folder path and hit F5 to run the code in order to merge all files on provided folder into current worksheet. If you want to start new merge for multiple xls or xlsx files you have to clear the current worksheet, or create new file for merge. I hope there’s also a way to merge spreadsheet similar to this but for LibreOffice, since i also work on several ods files. Thanks a lot for the code. I am looking to consolidate the data from different sheets to one sheet. How can we do that. With al do respect but isnt Power Query the prefererend wat to tackle thuis nowadays? Or is there a good argument why PQ is nog suitable for the job? I believe the latest excel versions have a function called consolidate to help with that. Hi when I try to run, it prompts me to type in a macro. what do I type in then? Thank you for this vba code, but I have a problem when I run de code, I get every time a popup for each sheet that says do you want to save or delete. What is wrong I have exel 2016 running. Thank for Code.. Its very helpful !! Further to this I have multiple sheets in My workbook and I want to consolidate all data in “Sheet5” of each workbook(excel) into one file as above. Thanks for the code. It works perfectly. Thanks for the code! Worked like a charm and now I have time to get other things accomplished. You are a life saver! Is there a way to incorporate the file name of the files we merge as well please? The code works very nice with Excel files. How can I do the same with CSV files? All my CSV files are within a single folder, and need to merge them to a single CSV file.